Kyle and I hiked the majority of the AT in Brooks Cascadia 7s. We both started in boots, figuring that during those first few cold wet months we would want to keep our feet dry and our boots, paired with tall waterproof gaiters, did just that. But around Virginia it started to get hot and our feet started to get sweaty and we knew it was time to try something neither of us had any experience with: Trail Runners. We had seen lots of people wearing them on trail and we were eager to check out this lightweight minimalist fad. 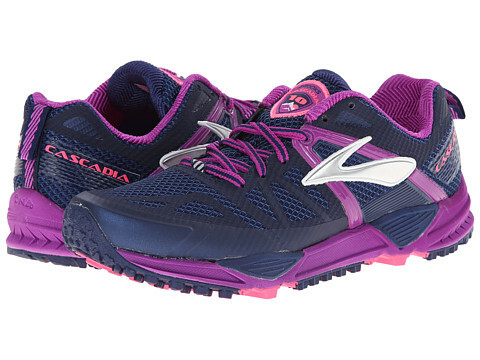 Simply based off of what was popular on trail (that’s pretty much all you do out there, poll people on their gear) we decided to go with Brooks Cascadia 7s. We each bought a pair off of Amazon on sale and never looked back. Our first set of Cascadias lasted us 700 miles and never gave us blisters and our second set lasted the next 700 miles. I am actually still wearing that pair today, to run and train in. They are certainly a little worse for the wear at this point but we have been hesitant to switch to a new pair of shoes because the Cascadia 7s have been so great. In fact, last summer we managed to find two more pairs of them online on Ebay and have stockpiled them in our closets for the PCT. Despite having an extra pair socked away for the trail we both know that those aren’t going to last a whole thru hike, so last night Kyle and I went to REI to try on every other pair of trail runners they had to offer and take notes for the future. We had been waiting to do this until the new Brooks Cascadia 11s came out because we had heard that they had fixed the problems with the 10s. Since we bought the 7s there have been the 8s and the 9s, both which were rumored to be great shoes although neither of us have ever used them (it is impossible to find these models online anywhere so I assume they were good) but the 10s got terrible reviews. The 11s just came out so it was time to head in and try them out, plus whatever else was available. I’m just going to come right out and say it, the 11s are awful. I have never known, immediately upon slipping on a shoe, that it was all wrong until I tried on the Brooks Cascadia 11s. They have this weird stretchy burrito wrap thing that connect the tongue of the shoe down bellow your arch and pulls up against your arch in a way that is both uncomfortable and unnerving. I was standing there grimacing when a very knowledgeable REI employee walked up and immediately noticed my dismay. “Oh, you don’t want to buy those,” she said, “The 11s are awful, they haven’t fixed anything from the 10s”. She went on to explain that in the next two or three years we could expect to see some really good stuff from Brooks, but the current Cascadias just weren’t cutting it. So we dove into uncharted territory. Kyle and I both tried on Peal Izumi’s N2 Trail Runners and Altra’s Lone Peak 2.5 Zero Drop Trail Runner. We were actually impressed with both brands and probably spent two hours trying on the two different pairs in different sizes and combinations. We kept walking around with one shoe from the Izumis and one shoe from the Altras on each foot, agonizing over which was the right choice. For a thru hiker it is kind of important to nail the shoes… you want to spoil your feet. Peal Izumi’s N2 Trail Runners: The Izumi’s are very structured and much stiffer sole on the bottom. They have a more significant drop than the Altras, which is closer to what I am used to with Cascadias. One of the coolest things about them are the amazing Sure Laces, which are designed to actually stay cinched when you tighten them (why don’t all shoes use these, they are awesome). The two things that worried me were that the back of the shoe didn’t feel like it was perfectly cupping my heel and where my big toe hits isn’t reinforced so I can see my toe ripping through the shoe at some point. 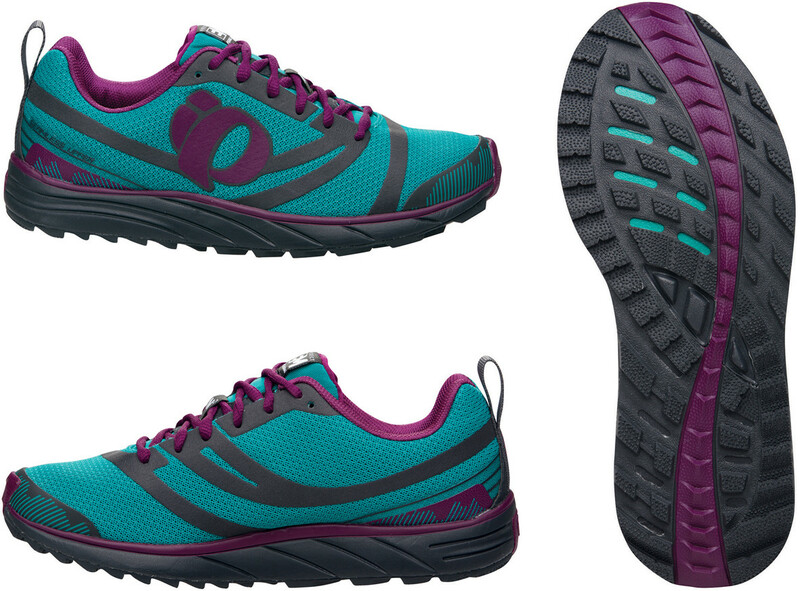 Altra’s Lone Peak 2.5 Zero Drop Trail Runner: These shoes have zero drop so they definitely feel different from my Cascadias, but I spend all day on my feet, often wearing shoes like Toms, so the lack of drop didn’t bother me. In fact, the shoes felt like they cupped my heel very nicely. They are much lighter than the Pear Izumi’s and feel much softer on your feet. The only problem I had with them was that they are quite wide, which is nice in the toe box because it allows your toes to spread out, but to get them to feel snug around the rest of my foot I had to cinch down on the laces. The tongue is quite thin and with the laces tightened appropriately it I could feel the laces through the tongue cutting into the top of my foot. What resulted was the rest of my foot feeling absurdly comfortable while the top of my foot felt terrible. I don’t know if a thicker softer pair of laces would fix this problem or if there is a way to add some extra padding to the tongue. In the end both Kyle and I went with the Pearl Izumi’s. I think we both felt more comfortable sticking with a shoe that felt more traditional and I just couldn’t stand the way the laces felt on the Altras. I also felt like the issue I had with the heel of the Izumis might be something that was fixed once I wore them in a bit. The Pearl Izumis run a bit small, I tried on both a 7.5 (what I normally wear) and an 8 and both were comfortable, although they fit me very differently. In the end I went with the 7.5 because it felt more snug on my foot (I had already been on my feet all day at the restaurant so I knew my feet were probably pretty swollen) and I felt it was going to be more comfortable once I broke it in. I wore them to the gym today and already the heel is feeling much better. Our plan is to break in the new pair of Izumis lightly so they are ready for us when we receive them on trail, after our saved pair of Brooks Cascadias wears out. Kyle and I had been dreading having to switch shoes but after this trip to REI I feel much better about the whole situation. The Pearl Izumis are great, they get amazing reviews, and are top pick on Outdoor Gear Lab. The Altras are an awesome second option if the Izumis give us blisters or cause stress injuries to our legs. It is nice to have options and branch out. P.S. Just a little pro tip, always try on shoes at the end of the day, preferably after you have spent some time on your feet. This way your feet are swollen and you know the shoe is going to be comfortable while you are walking a lot! P.P.S. You should have seen how much attention my Brooks Cascadia 7s got. All the REI employees kept stopping and saying, “Oh my gosh, are those the 7s!”. It was like they were a celebrity. I am going to continue using them until they have disintegrated. Brooks switched up all their shoes this year, which is sad. I personally run in the Pearls and love them. I have to say that, if I find some footwear (not just for walking) which I like and which are any good, I try to stockpile them too. The makers almost always drop the ball afterwards and either stop doing them altogether or ‘improve’ them in the wrong direction! While far removed from the world of hiking, Inov-8 is my go to brand and I know they make an assortment of trail running shoes. I absolutely love the Inov-8’s I have, very comfortable. yeah, I have a pair I use for scrambling. Because they usually have a full shank and a really really stiff sole they aren’t as great for long distance hiking. Too stiff. A trail runner is great because it is light and breathable but has great cushion and traction. Just about finding the right one! Honestly Brooks dropped the ball on all of their shoes in these last iterations. I won’t even go near the Adrenaline for road running anymore. The running store here convinced me to go with montrail Bajada for my tail shoe (and as a result I now wear their fluidflex II for road running). They have heat moldable inserts that will perfectly mold and fit your foot. All my ankle and calf issues suddenly went away when I got their shoe on for my marathon. I’m not sure what you’d need for a thru hike in a shoe, but I’m a big fan of the graphite plate in the bottom of the bajada. I cannot count the times I mistakenly landed on a jagged rock that would have destroyed my old Brooks shoe in a second, and these things held up like a champ. My one complaint is that montrail claimed they are waterproof, but after a run through some downpours, my socks would look like if just stepped out of a slasher horror film (the shoes are red). I’d have to say, when I first started running I thought I would never leave Brooks, but im a montrail man. I have heard good things about Montrails, but never tried any on. I will have to check them out. The good thing for us is that we actually do not want waterproof. It’s better to have something that can dry quickly and breath really well because more than anything we are worried about our feet sweating. But yeah, seriously Brooks, get yourself together! Great info!!! The heavy bulky hiking boot is all I’ve ever known, although old they are still hardly broken in so I don’t feel the to trash them quite yet. What I like about the boots though is that the soles are tougher and your feet are protected from rock, stumps and other debris you may traverse. I’ve always longed for something lighter yet as sturdy. Shoemaker’s listen to our cry! What you said about toes poking through seems to be an ongoing problem shoemakers have yet to resolve because I have a couple of cross trainers that are doing or have done just that. The search for a good shoe is definitely a challenge, especially when you’ll be on your feet for hours and days on end. I hope your PI’s do the job! Trail Runners usually do walk that fine line between boot and shoe. The soles are really stiff, especially on the ones we just bought, the Pearl Isumis. It is actually hard to bend them they are so stiff. They are built to withstand trails, rocks and roots! If you never have I highly recommend trying a pair out, they are way more comfortable than a boot. Many people are unsure about switching to a trail runner but most that do will never go back. Brooks really dropped the ball on the Cascadia 10 and 11. The 10 had a strange overlay below the bottom lace on the toebox that made it crease in a weird way. People were lucky to get 150 miles out of them before that area developed a huge hole. I live very close to the PCT, so I get to see thru hikers coming through from April to June. A few years ago, the Cascadia was virtually the only shoe I saw. Not any more. The Altra Lone Peak has taken a large share of the market, but the outsoles have not been the most durable. Still, the uppers and midsoles are durable, and the foot shaped toebox is deluxe. I’ve put quite a few miles on a pair of Pearl Izumi M2s. They are a great shoe. The upper is breathable and durable, the midsole is resilient with a nice stone guard. I really love the outsole as well, except for when I’m on wet rock or slick surfaces. One other shoe to checkout for thru hiking would be the Nike Wildhorse 3. Nike is new to trail running shoes, but this model is a beast. I’ve worn a pair for close to 300 miles and they don’t show much wear. They have a wide toebox, durable outsole, and last a long time. Order half a size up though. Best of luck with your PCT planning!